Ding! Ding! Ding! Round 1! Round 1 of this cycle’s IUIs is complete. In the left corner, measuring in at a substantial 20.5 mm, Folli “the baby maker” Eggerson! And in the right corner, measuring in at…oh wait, Folli wins by default, as he’s going unchallenged. According to Dr., one egg is just fine for a young pup like me (I will never get tired of him telling me I’m young). He explained today that traditional ovulation predictors don’t work for women with PCOS, as their hormones are all wacked. Interesting, as I used to use them and they turned positive when I thought I should have been ovulating. 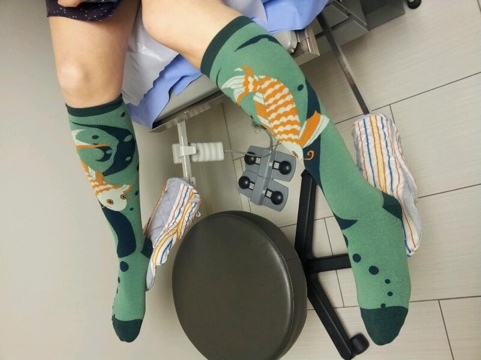 Big thanks to Lori at Wanted: Family of Three for my fancy IUI socks. I couldn’t wait to be able to wear them! Koi fish are supposed to bring luck…let’s hope these swimmers (and J’s!) do their jobs this month. A very flattering (!!) shot of Kois and stirrups. Yes, those are oven gloves on the stirrups.